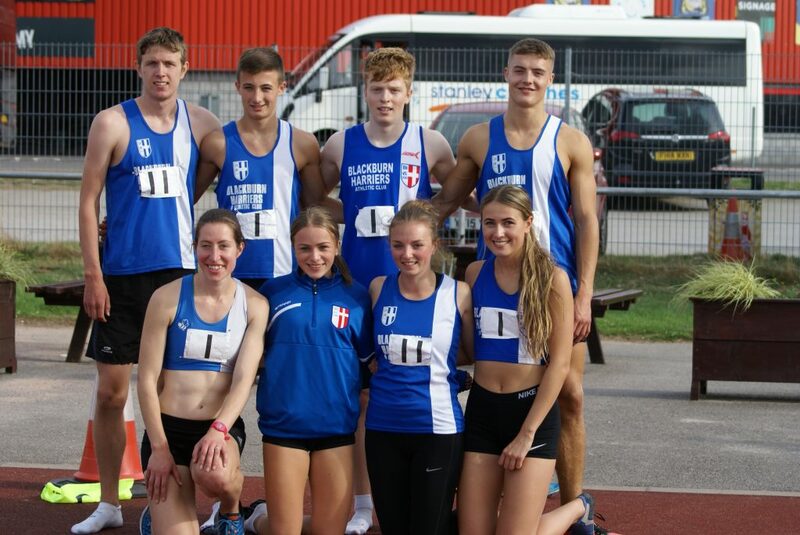 A great day for the Harriers at Doncaster yesterday as the Team secured promotion back to Division One after finishing so close – by just eight points – to the Isle of Man Team which saw both teams deservedly winning the two promotion places. 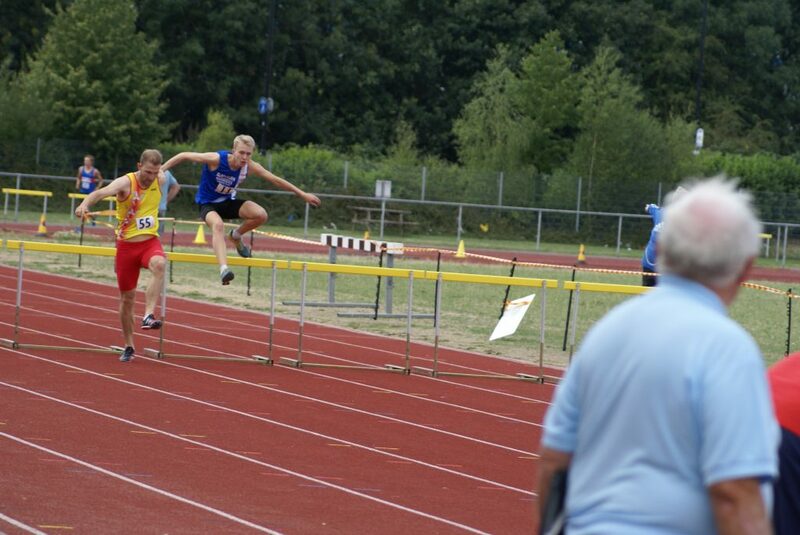 Every one of our athletes, over the whole season, deserve a very big pat on the back. 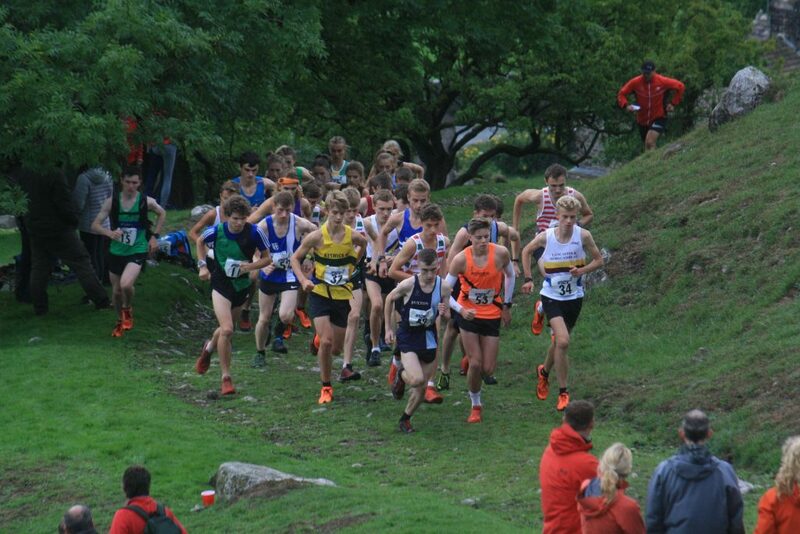 Team spirit and the determination to do well individually and collectively has been fabulous. 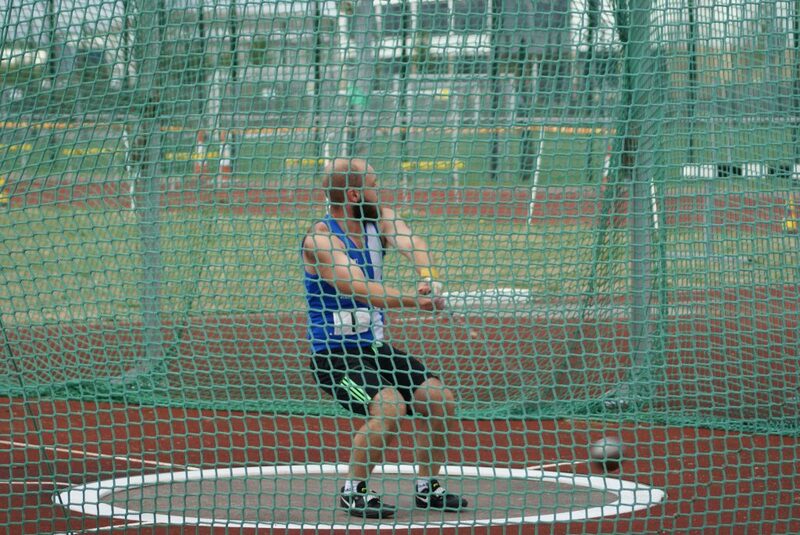 Athletes have really put themselves on the line to achieve this result and are deserving of all the praise that comes their way. 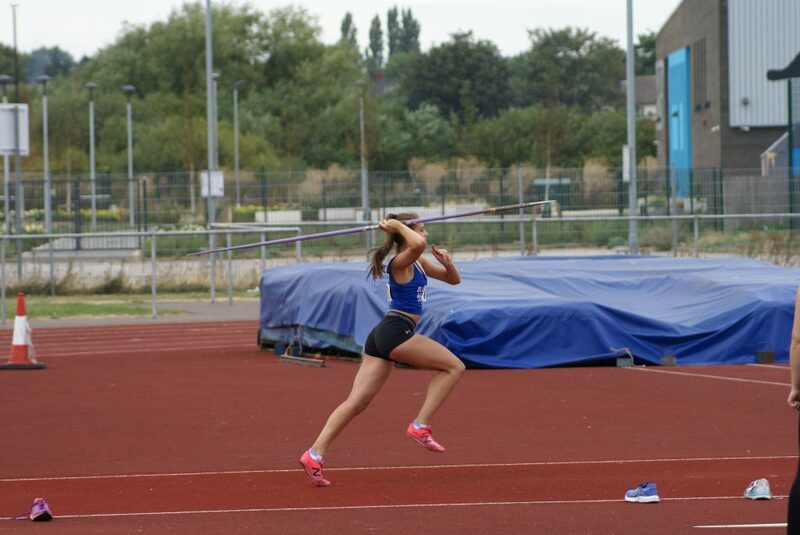 Holly Bradshaw had been competing in a wind affected Diamond League Pole Vault competition on the day of the Promotion match. 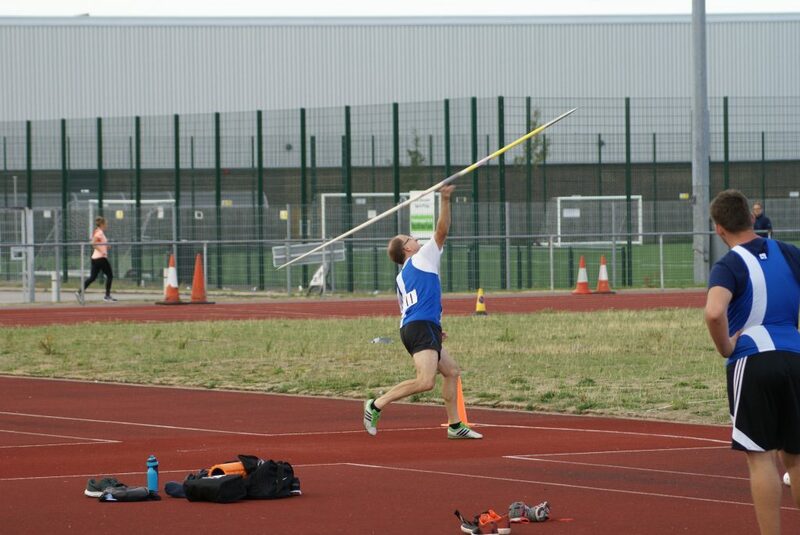 The conditions were not in the least condusive to good pole vaulting which could be seen from the winning clearance of 4.60m. 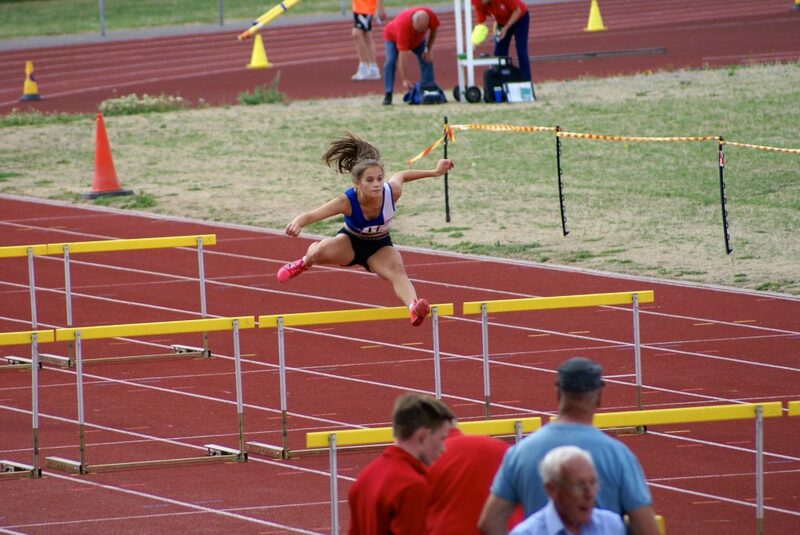 Holly placed 5th after clearing 4.40m and afterwards sent everyone in the Team a message saying “Amazing and well done everyone and hope everyone has a welle arned rest”. 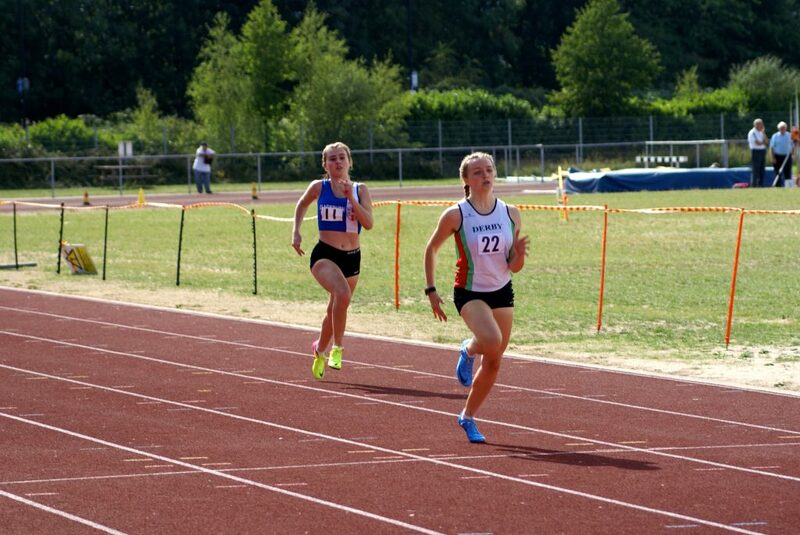 Going to start the report at the end! 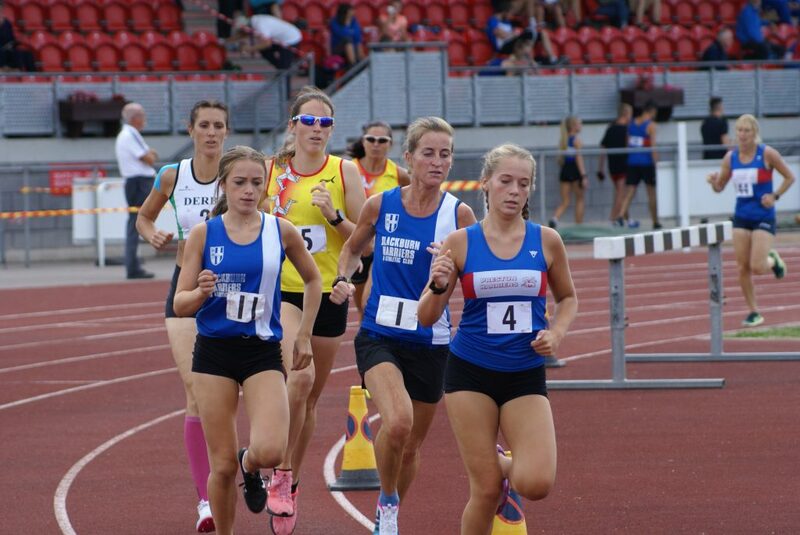 And that is because the Women’s 4 x 400m Relay Team broke the existing Club Record set in 2005 at Cleckheaton, thriteen years ago. 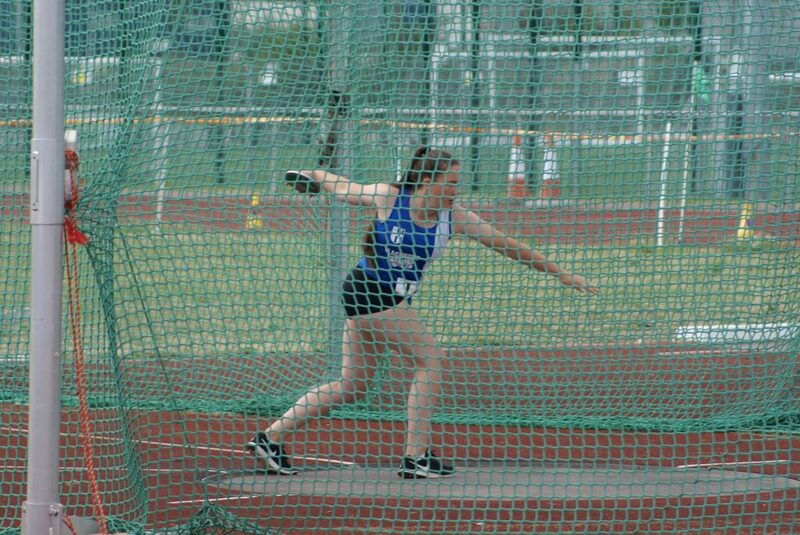 The time clocked that day was 4.08.4 with the team consisting of Leonard, Scarret, Wood, Powell – at Doncaster Alison Leonard as she was in 2005 became Alison Lundy (with a 57.6 last leg) as she, along with Charlie Coy on Leg one (63.2), Ellen Sagar-Hesketh on Leg 2 (63.6) and Maddie Elliott on Leg 3 (62.2) posted a new Club record of 4.06.6 as they finished second to the Isle of Man by one half of a second. 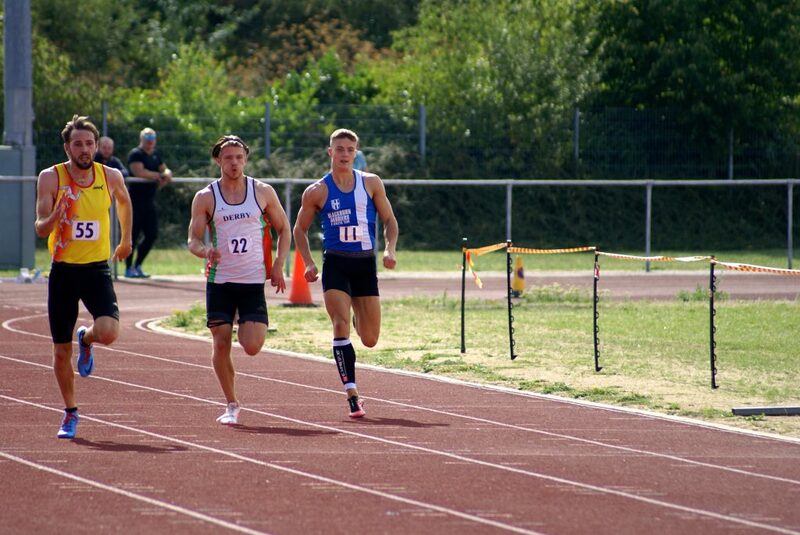 The Men’s 4 x 400m Relay team consisting of Ross Liddle, Zac Howe, Solomon Brown and James Marchant ran the fastest time of the season as they won comfortably in a time of 3.34.4. 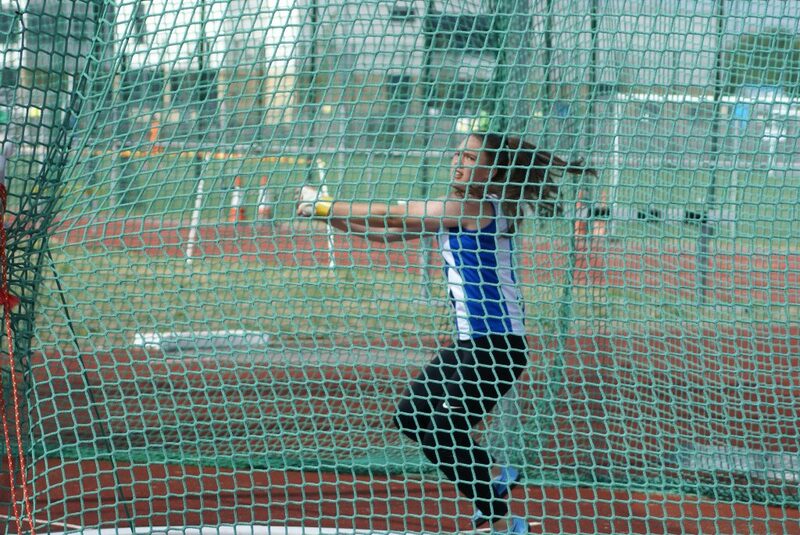 The throwers have contributed a huge amount to the teams success this season and led from the front by Anna Peers who once again had an excellent match placing 3rd in the Hammer ‘A’ (24.46m), winning the Discus ‘A’ with a new PB of 37.57m, winning the Javelin ‘A’ with a throw of 39.57m and coming 2nd in the ‘A’ Shot Putt with 10.65m. 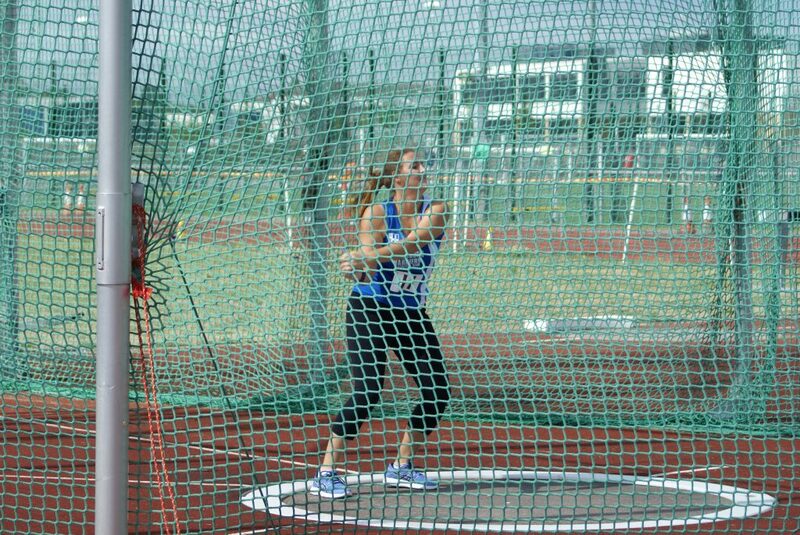 Great back up to in the ‘B’ competitions which saw Emily Taberner set two new PB’s in the Hammer (2nd) with 22.28m, an improvement by over four metres, 1st in the Discus (24.25m) and a new PB by a metre and a half, followed by winning the Shot Putt with 7.83m. 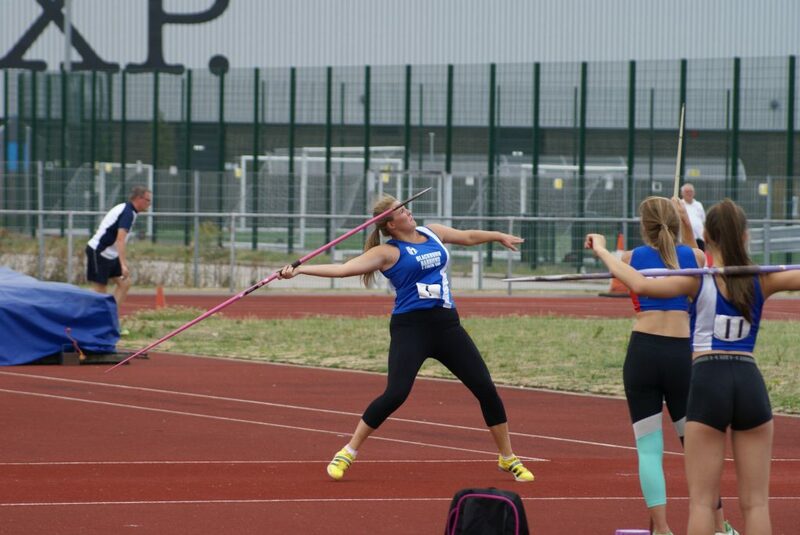 U17 Millie Coy goes from strength to strength as she set a new PB by over four metres too in the ‘B’ Javelin throwing 33.76m to win the event for the team. 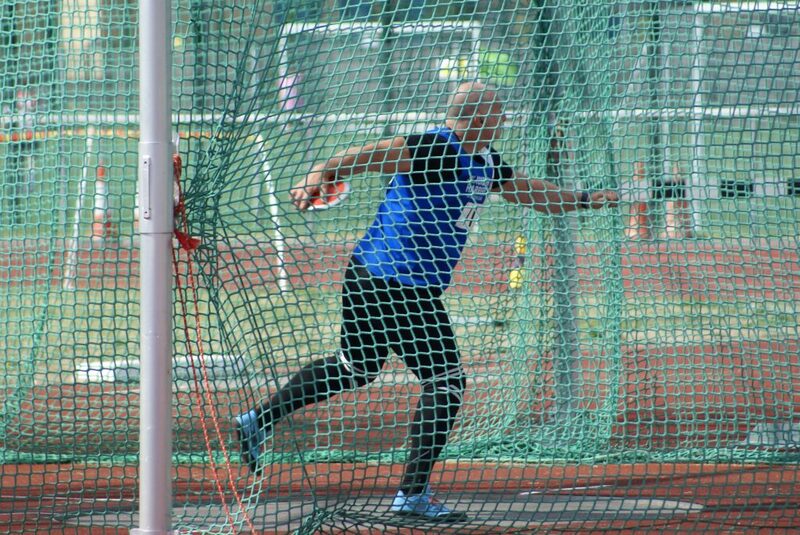 In the Men’s Throws Nathan Billington was close to his personal best as he threw 37.29m in the ‘A’ Hammer in 3rd place with Anthony Kent winning the ‘B’ (32.59m). 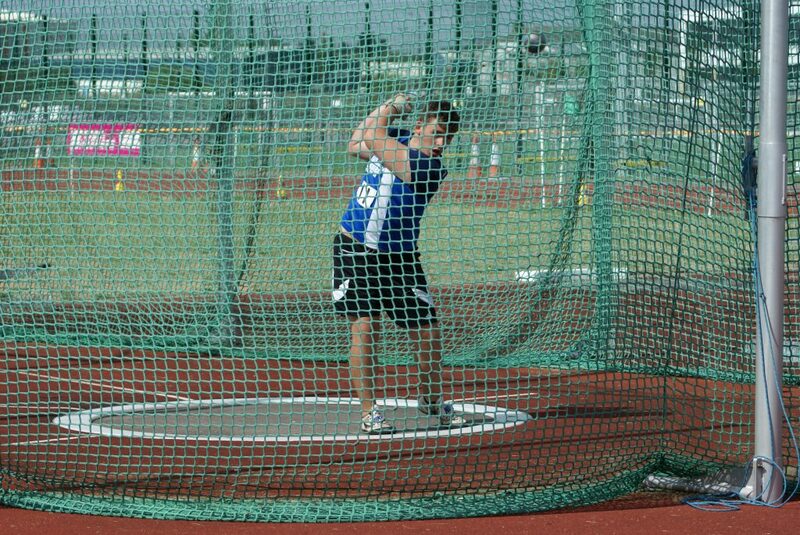 Onto the Discus where Anthony threw 32.65m in the ‘A’ as Tony Balko won the ‘B’ with a throw of 29.35m followed by the Shot Putt which was a very good competition, Anthony placing 5th with 10.54m and Tony Balko 4th in the ‘B’ with 9.36m. 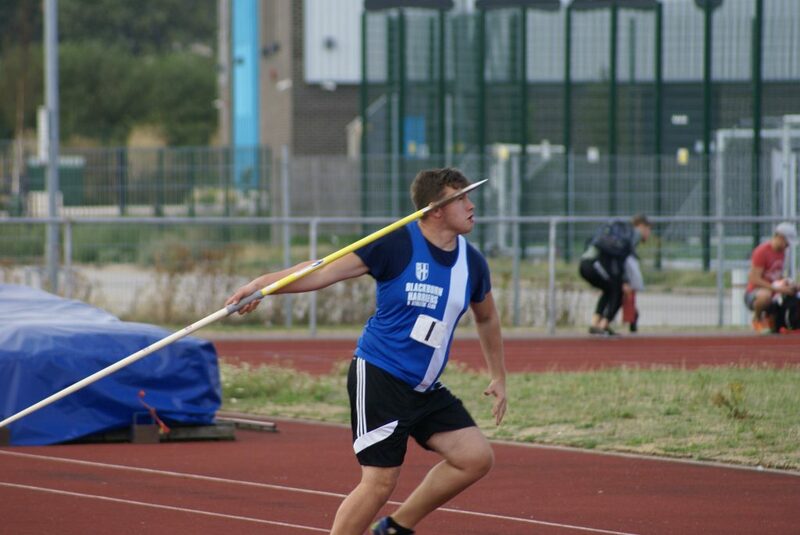 Final throw of the day was the Javelin which saw Anthony place 3rd in the ‘A’ (36.61m) and John Cookson 2nd in the ‘B’ with a throw of 29.44m. 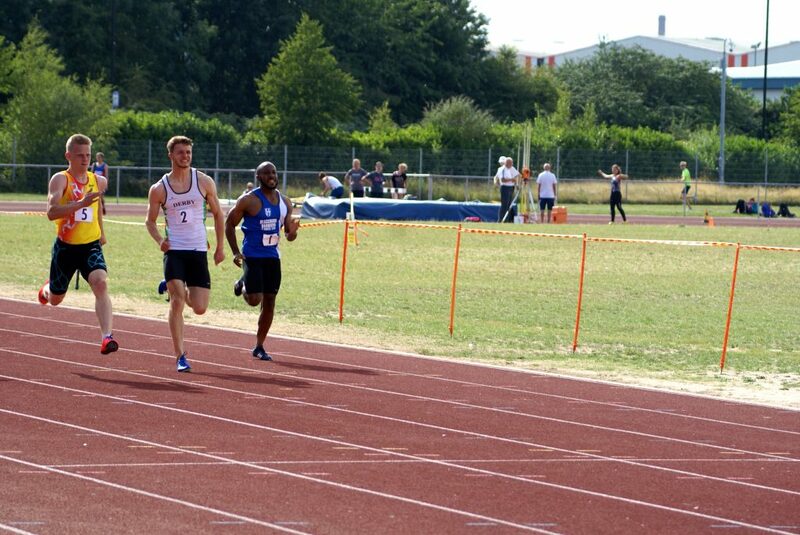 A very good day for Brandon Zinyemba who finally broke 11 seconds as he clocked a new PB time of 10.9 in the ‘A’ 100m – the same time as the winner. 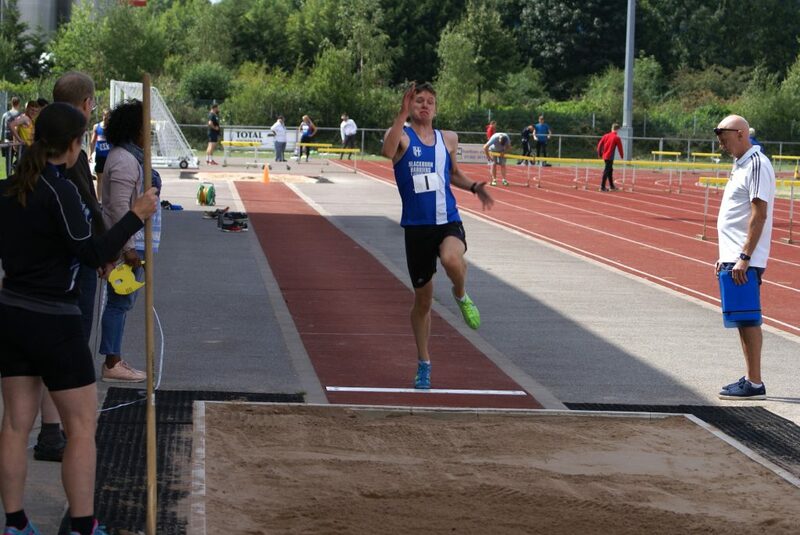 The 200m saw Brandon clock 22.9 in 4th spot and a 3rd place for Ross Liddle in the ‘B’ with 23.1. 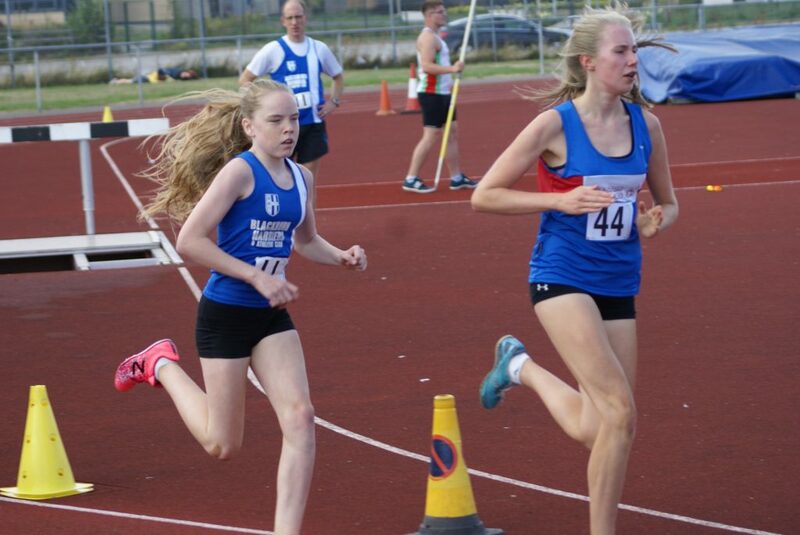 Bailey Madden and Emily Warren paired up again in the Women’s 100m and 200m races with Bailey placing 2nd in the ‘A’ 100m (12.6) which equaled her personal best and 3rd in the 200m (26.8) – Emily came 2nd in the ‘B’ 100m with a time of 13.2 and 2nd again in the ‘B’ 200m (27.5). 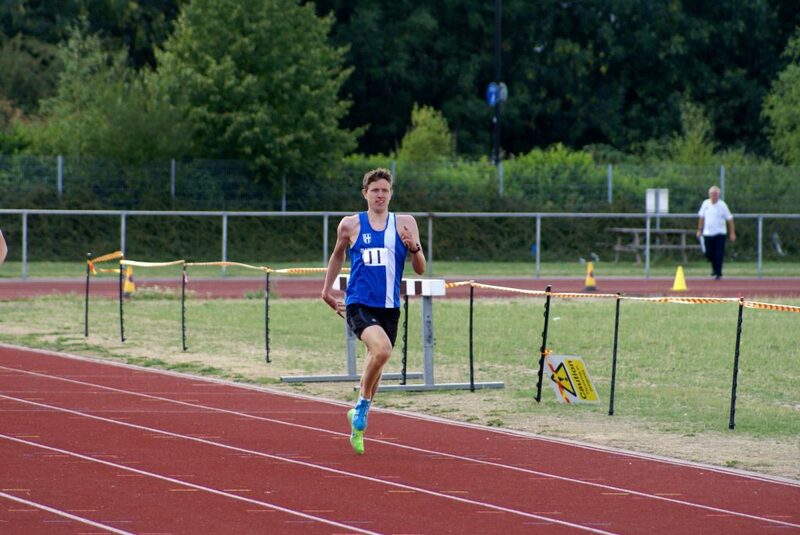 Ross Liddle last ran a 400m in July 2017 where he clocked 50.6 – one year later he took on the ‘A’ 400m and won the race by a second in a time of 51.4, backed up by Zac Howe who was coming off the back of not a lot of training, winning the ‘B’ race in 54.4. 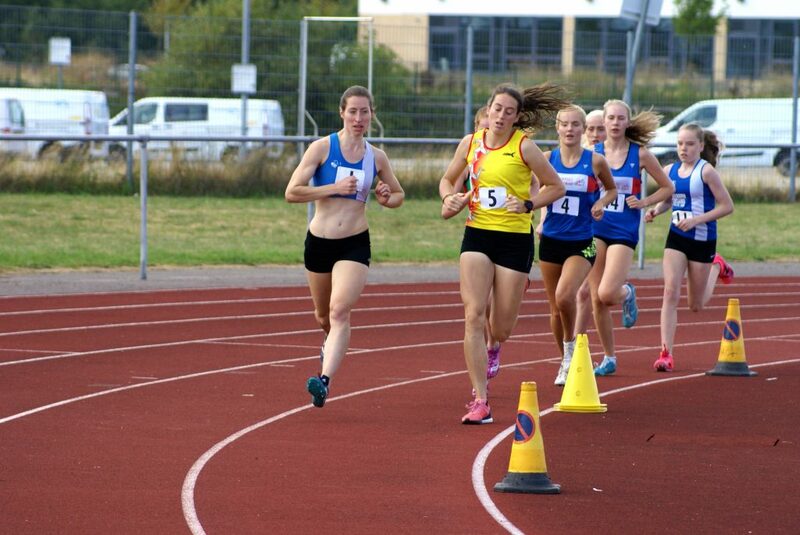 Charlie Coy came home in 3rd in the women’s ‘A’ 400m with a time of 63.5 with Ellen-Sagar Hesketh just one tenth outside her personal best in the ‘B’ posting 61.8 in 3rd, the same time given to 2nd place. 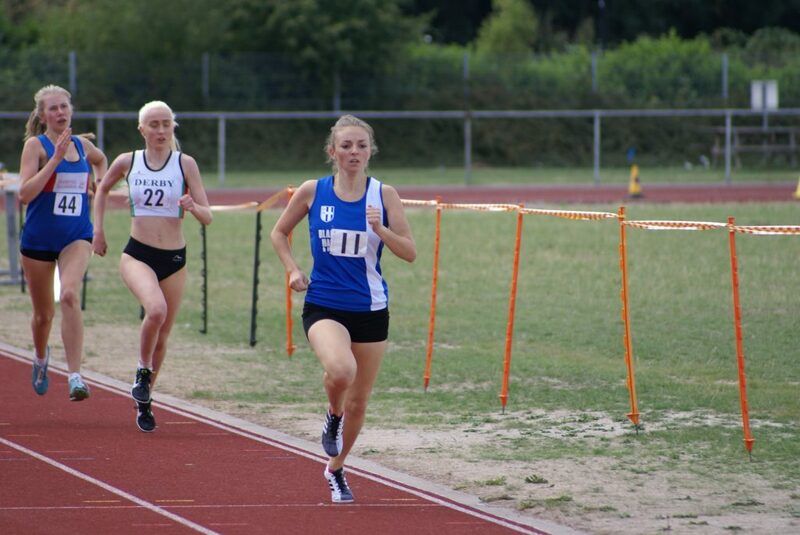 The Women’s team produced five wins and a 2nd place in the Middle Distance events which was a great performance by them. 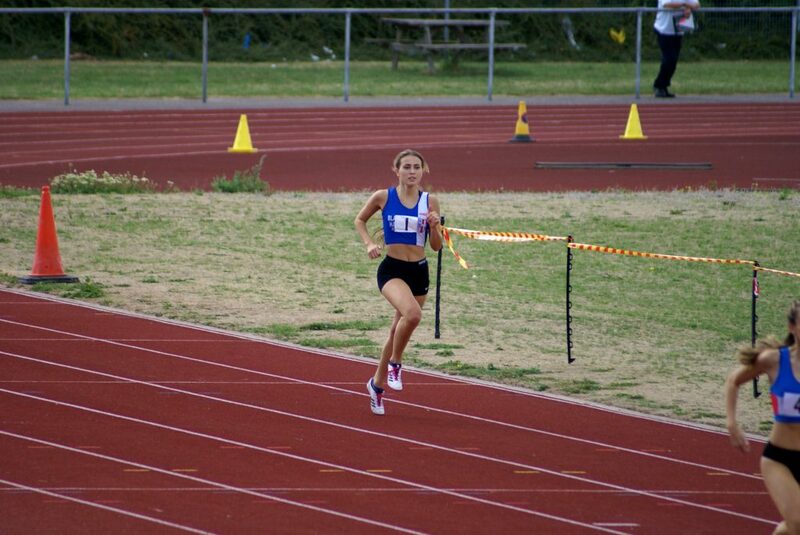 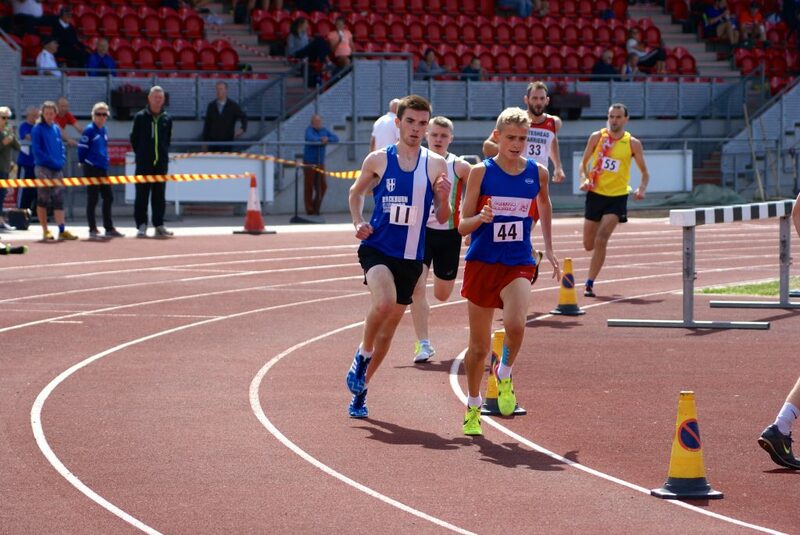 Alison Lundy won the ‘A’ 800m in 2.13.0 whilst Ellen-Sagar Hesketh won the ‘B’ in a very close race in 2.25.4. 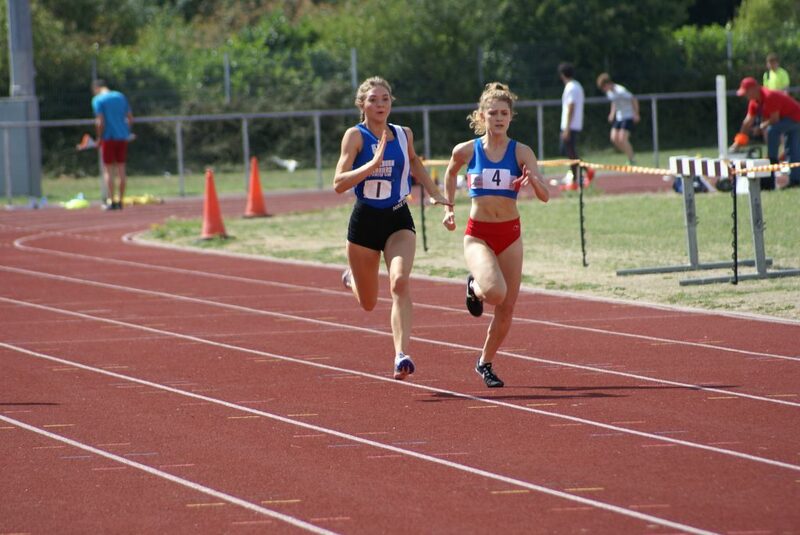 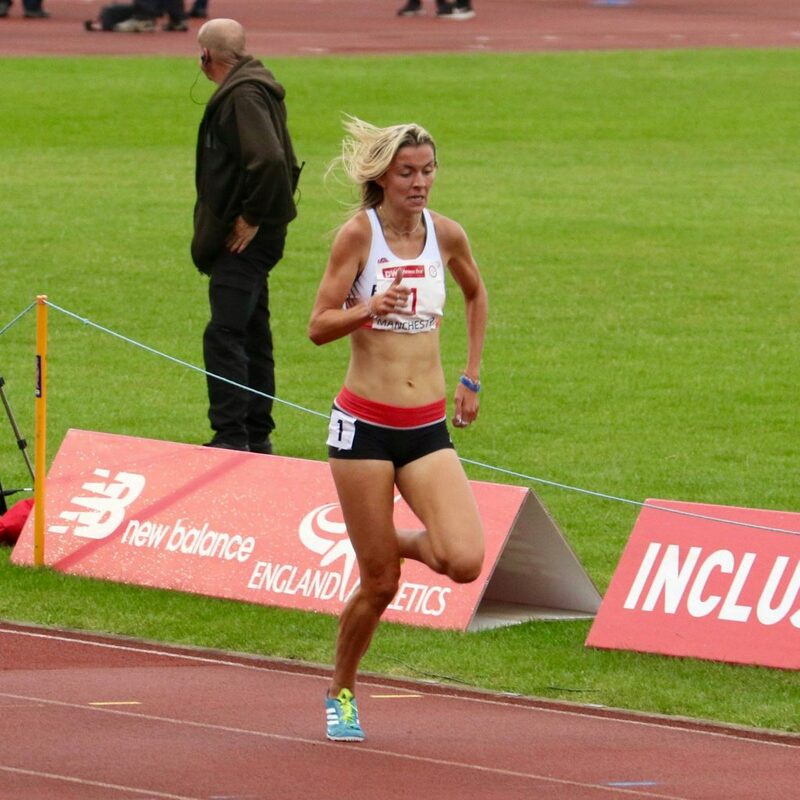 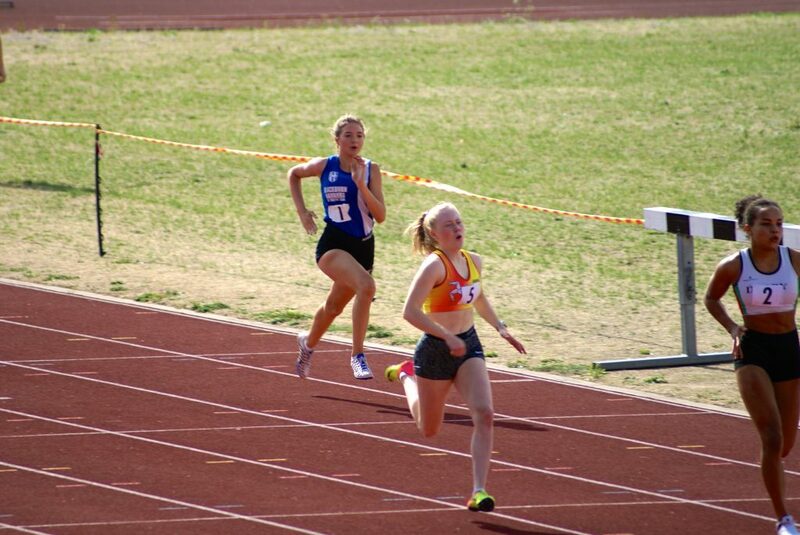 The ‘A’ 1500m was a great race with Alison Lundy and Rachael Franklin running 1400m side by side bringing the race down to a 100m sprint which saw Alison take it in 4.40.6, the same time as Rachael in 2nd place. 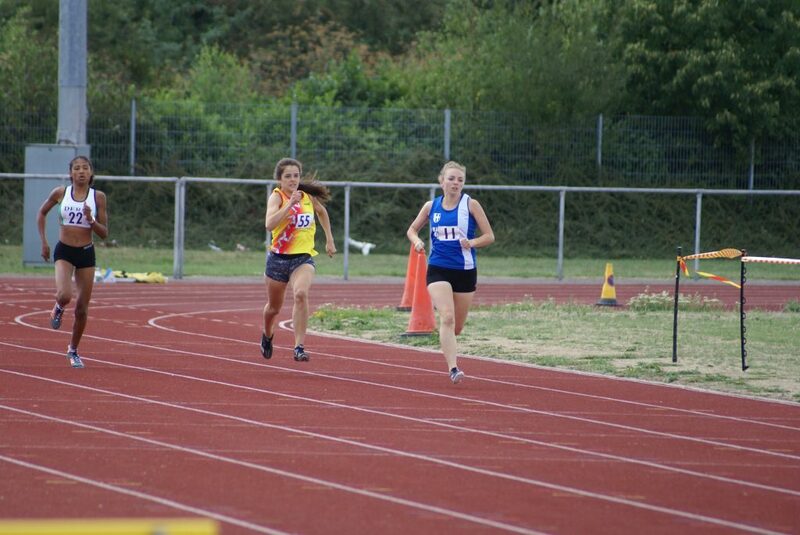 Another good and improving run from U17 Amy Davies saw her win the ‘B’ 1500m in a seasons best of 5.01.5. 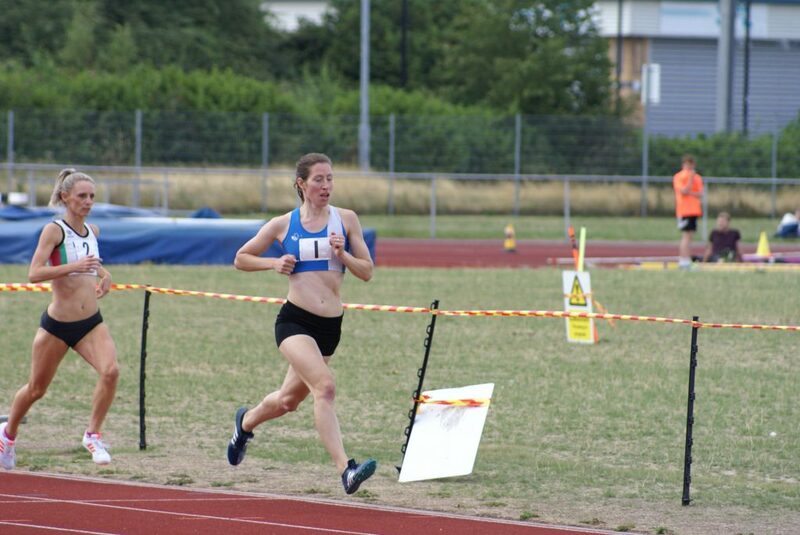 In the 3000m Joanne Nelson took on Rachael Franklin in the ‘A’ race coming home in 2nd spot (11.05.3) whilst Maddie Elliott backed that up really well by winning the ‘B’ in a time of 11.17.6. 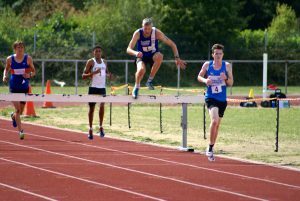 Like the Women, the Men were running into a very strong headwind and although it was warm on the day, the wind did impact on times in these distances. 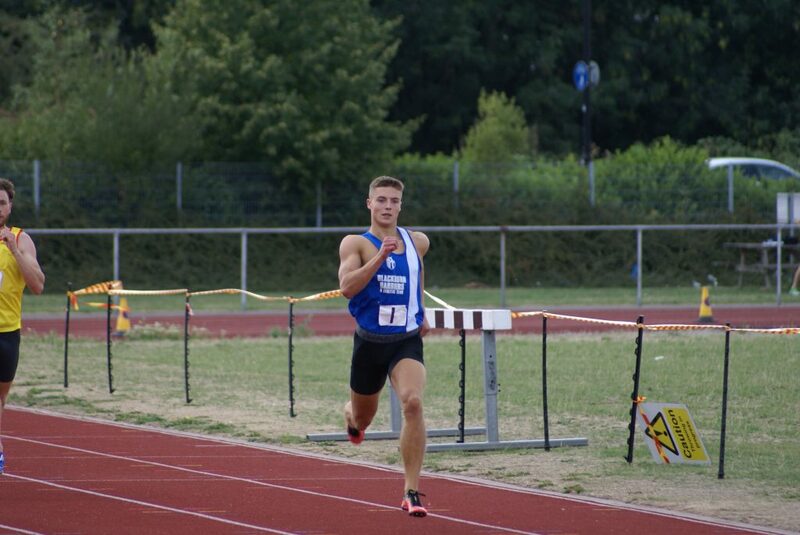 Zac Howe ran the ‘A’ 800m in 1.59.8 to finish 4th whilst Joe Gebbie continued his very good season with a win in the ‘B’ Race clocking 2.04.00. 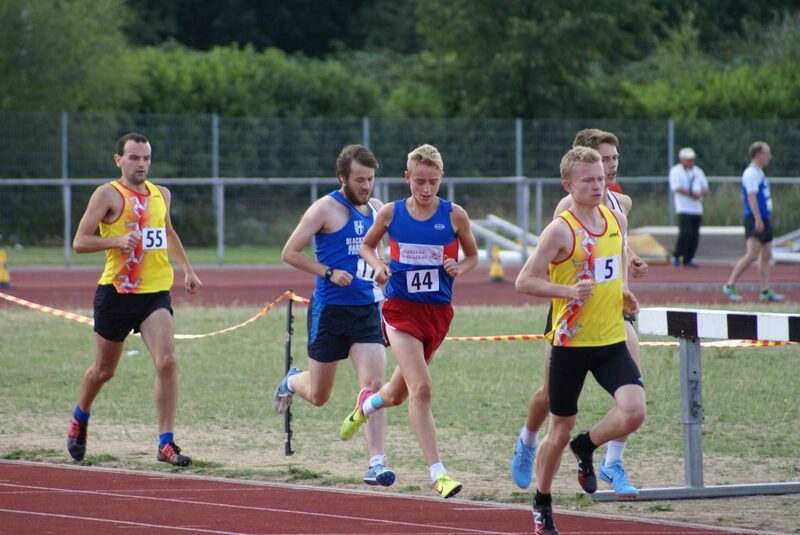 James Marchant was another athlete who was coming into the event short of training but still ran pretty solidly for a 3rd spot in the ‘A’ 1500m (4.19.9) whilst Karl Billington who volunteered to run both the 1500m and 5000m ‘B’ races as we were misisng athletes, won the ‘B’ in a seasons best time of 4.22.7. 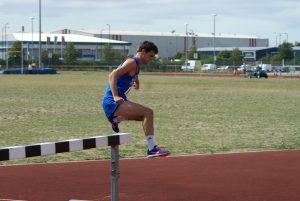 The 3000m Steeplechase had Chris Davies coming home in 2nd in the ‘A’ with 10.36.7, just five seconds outside his personal best which in that wind was a very good run. 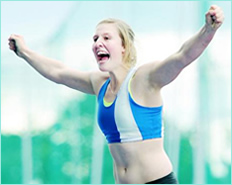 Joseph Howe epitomised everything you need to know about wearing the blue and white vest. 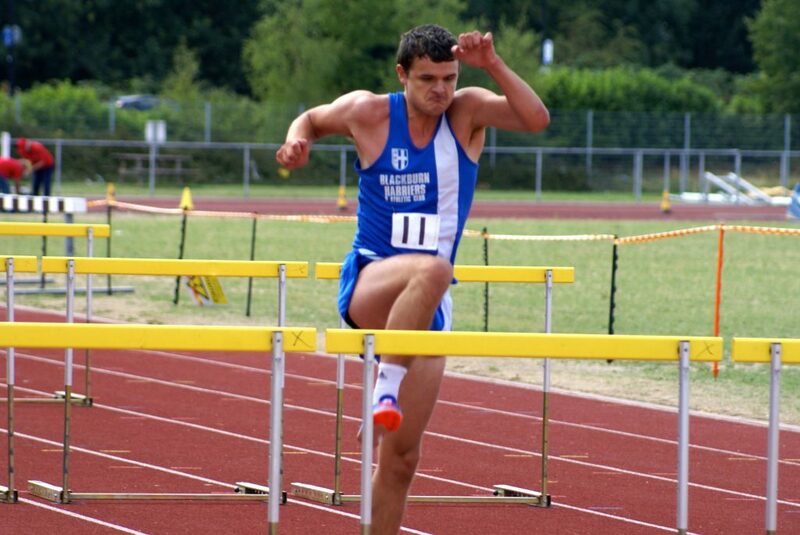 Having just gone through a period of glandualar fever, Joe ran the ‘B’ to win it and earn valuable points in a time of 12.15.7, a time minutes away from his best time but in terms of the effort and commitment to finish, probably one of his most heroic. 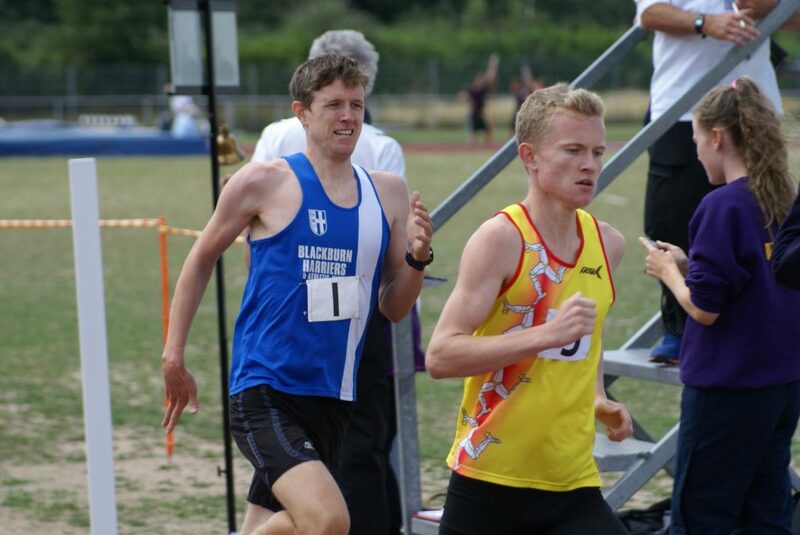 Ben Fish has also come off a period of illness and he was up against the in form Ollie Lockley in the ‘A’ 5000m and for 11.5 laps they were neck and neck all the way round; But on the last lap Lockley had the leg speed to pull away from Ben which saw Lockley win in 14.55.7 and Ben finish 2nd with 15.08.6. 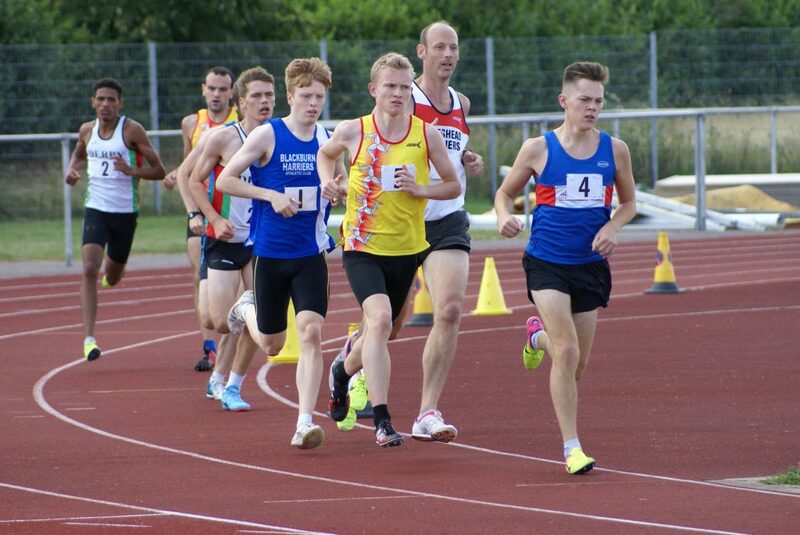 Karl Billington who had a run a seasons best in the 1500m just 25 minutes earlier ran really well in the ‘B’ to clock 17.07.2 in 3rd place adding more vaulable points to the teams total. 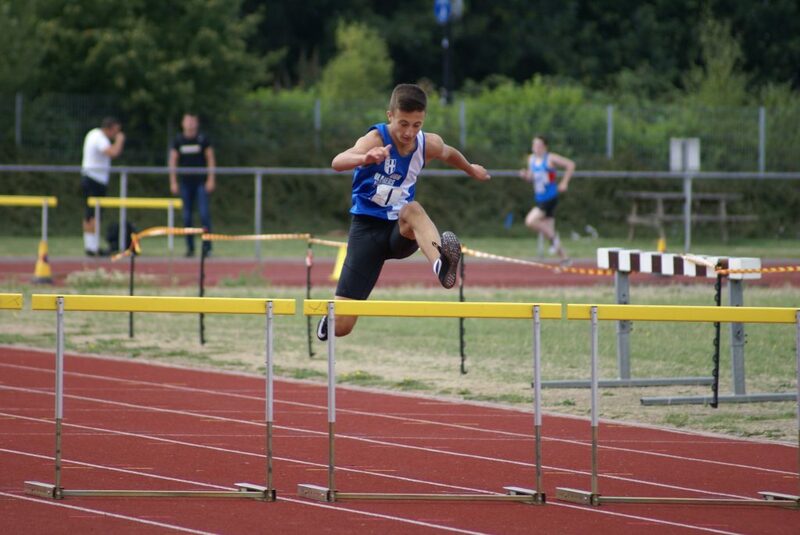 The pairing of Solomon Brown and Nicholas Smith in the 400m Hurdles has proved really productive for the team this year and again so today with Solomon coming 2nd in the ‘A’ in 60.9 and Nicholas winning the ‘B’ as he finished like a train over the last 50 metres to take the win on the line in 63.6. 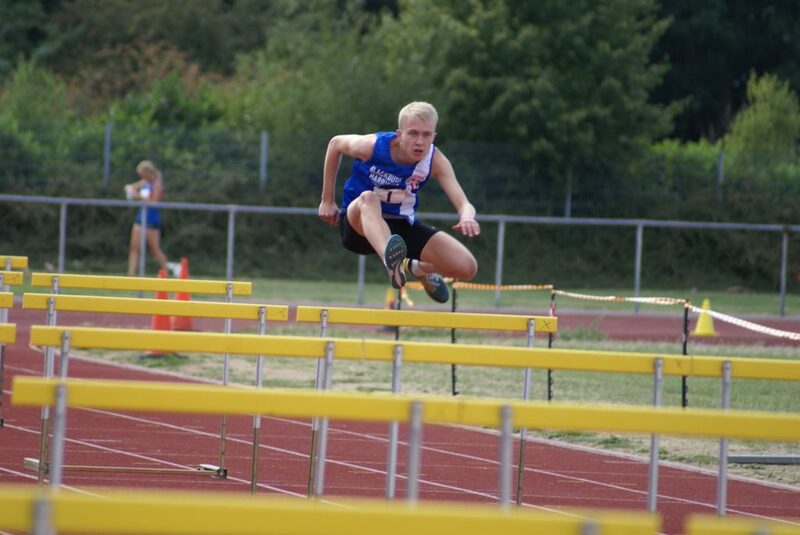 Nicholas and Joseph Howe teamed up in the sparsely populated 110m Hurdles with Nicholas 2nd in the ‘A (20.0sec) and Joseph 2nd in the ‘B’ (23.3sec). 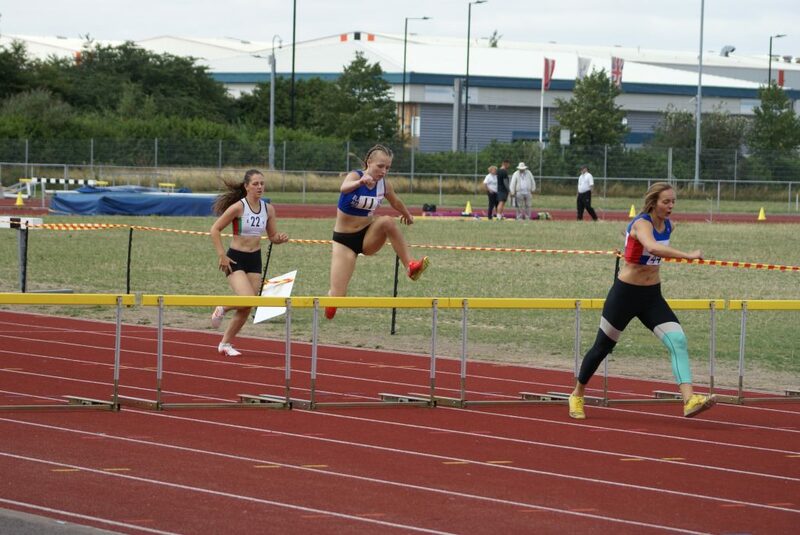 In the Women’s 100m Hurdles it looked as though Polly Pearse had never been away in the ‘A’ Race – only her second race in the event since September 2016 – as she won in a new PB (by three tenths) clocking 16.3; And what about Millie Coy – running her first ever 100m Hurdle race – she won the ‘B’ in 18.3. 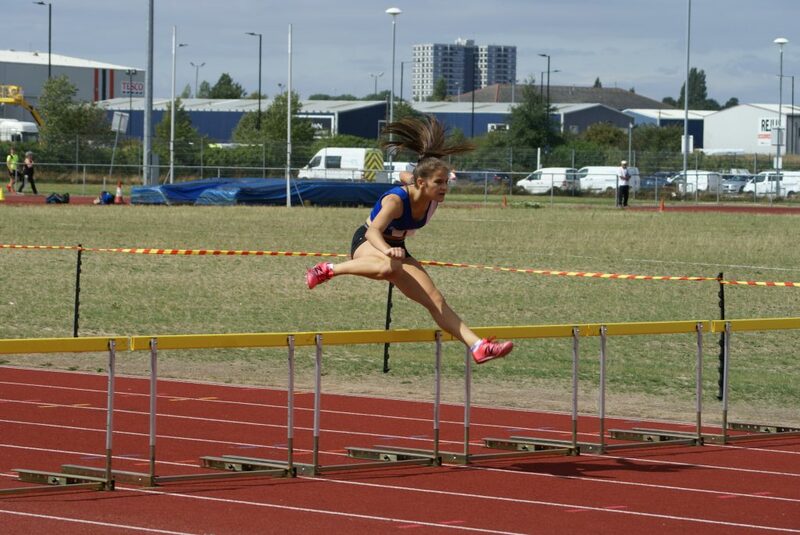 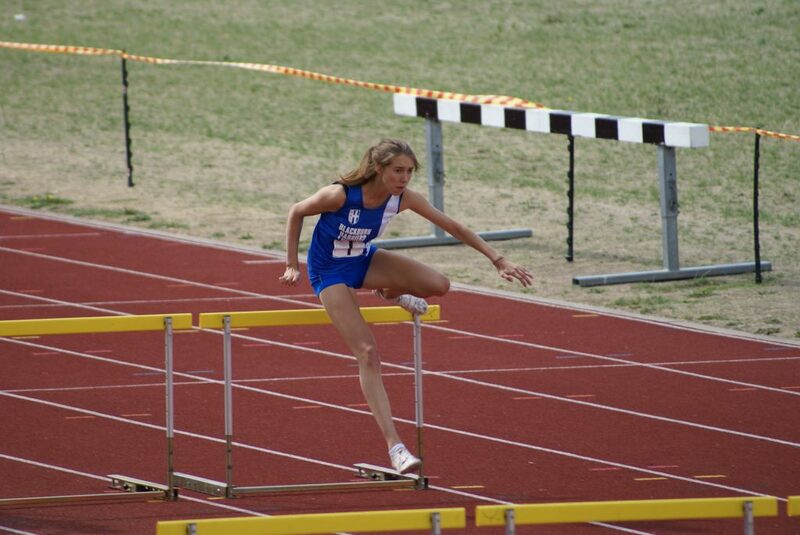 Millie had started out the day in the ‘A’ 400m Hurdles posting 72.5 in 3rd place with Chloe Bleeks 3rd in the ‘B’ (76.7). 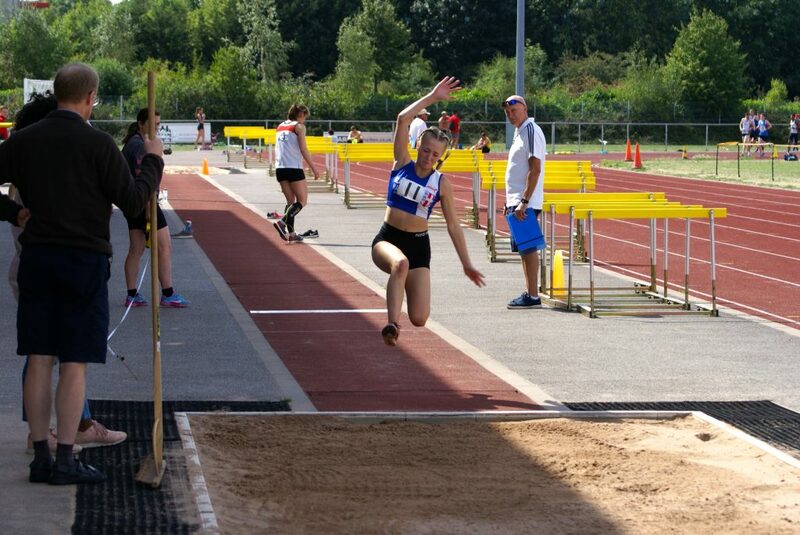 After posting a new PB in the Hurdles, Polly Pearse took on all three Jumps events finishing 3rd in the ‘B’ Long Jump with 4.54m, 4th in the ‘A’ Triple Jump (9.94m) and 2nd in the ‘A’ High Jump with a clearance of 1.50m. 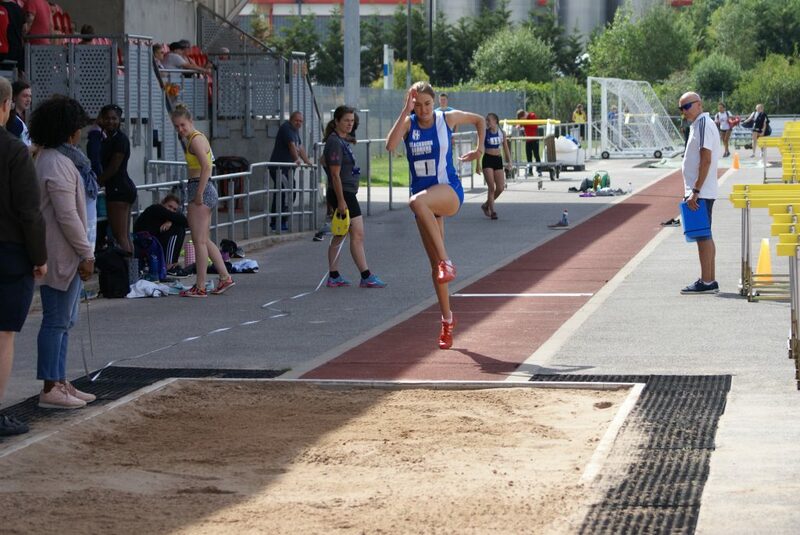 Chloe Bleeks came 5th in the ‘A’ Long Jump (4.56) and 2nd in the ‘B’ Triple Jump (9.37m) with Teigan Fawcett coming 2nd in the ‘B’ High Jump clearing 1.40m. 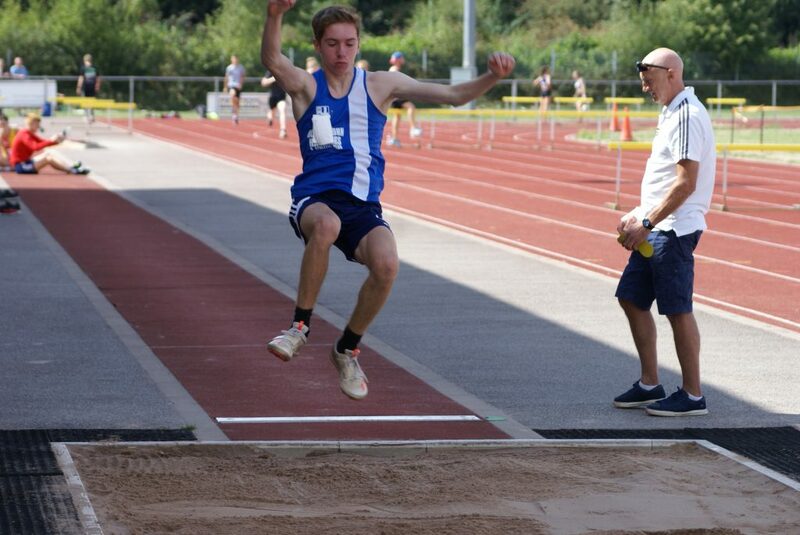 Last minute changes on the day meant that Zac Howe stepped into the Long Jump and Triple Jump placing 4th in the ‘A’ Long Jump which he last did in 2012 setting a new PB of 5.28m and then came 4th in the ‘B’ Triple Jump with 9.31m. 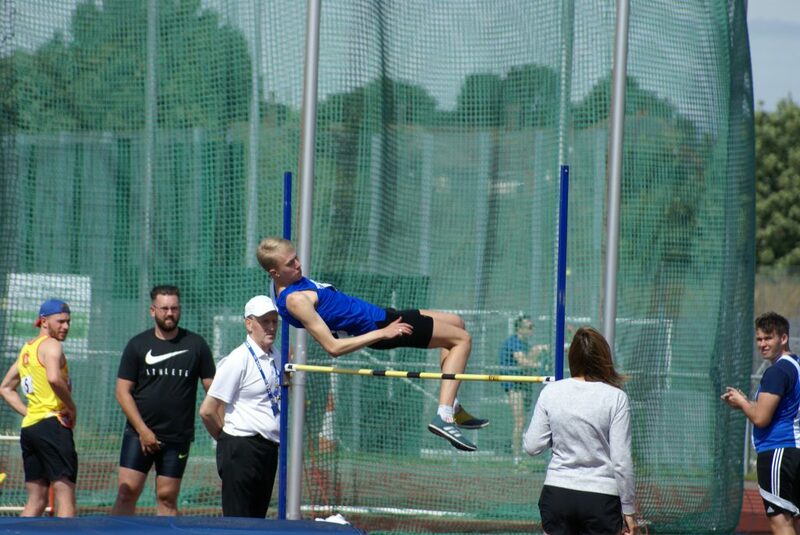 Ben Branton in only his second Senior competition jumped 5.04m in the ‘B’ which was a great effort by this promising U17 young athlete. 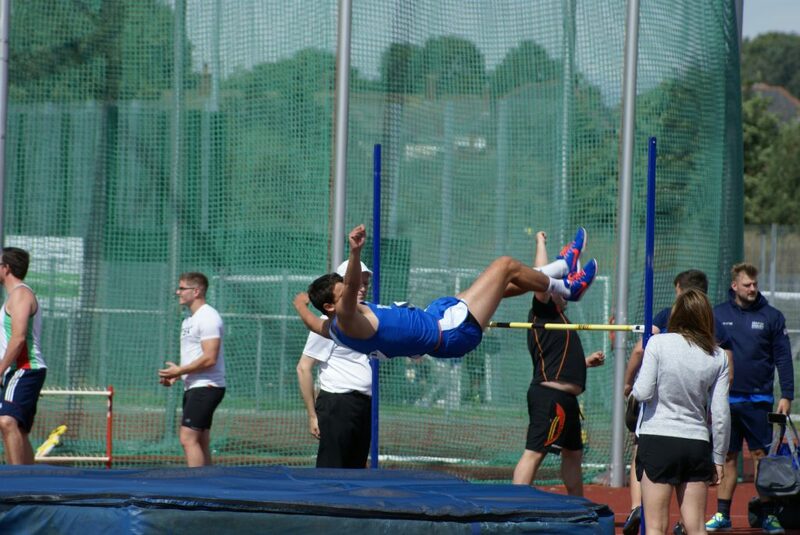 Nicholas Smith who has contributed such a huge amount to the team this year set a new PB of 11.16m in the ‘A’ Triple Jump in 2nd place, going on to clear 1.65m in the ‘A’ High Jump (2nd) with Joseph Howe also 2nd in the ‘B’ High Jump clearing 1.50m. 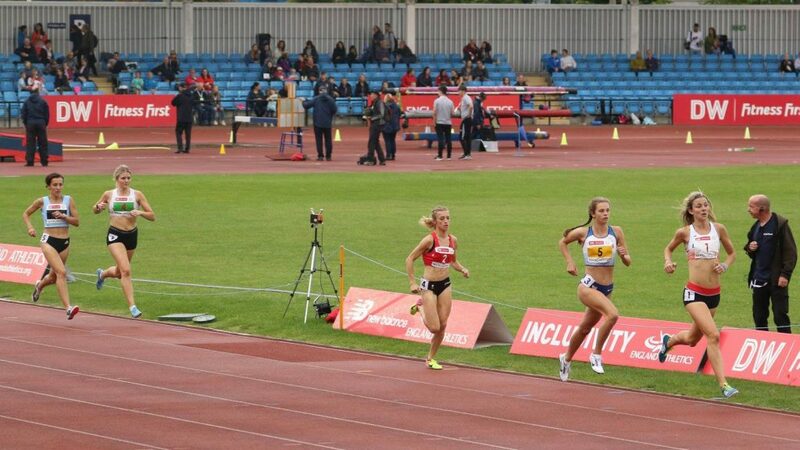 After winning the 5000m at the BMC in Milton Keynes last Saturday evening, Jess Judd was competing again after being selected to run for England at the Home Countries International at Sportscity on Wednesday night and had a convincing win in the 1500m, winning in a time of 4.11.96 from Beth Kidger in 2nd position (4.22.30). 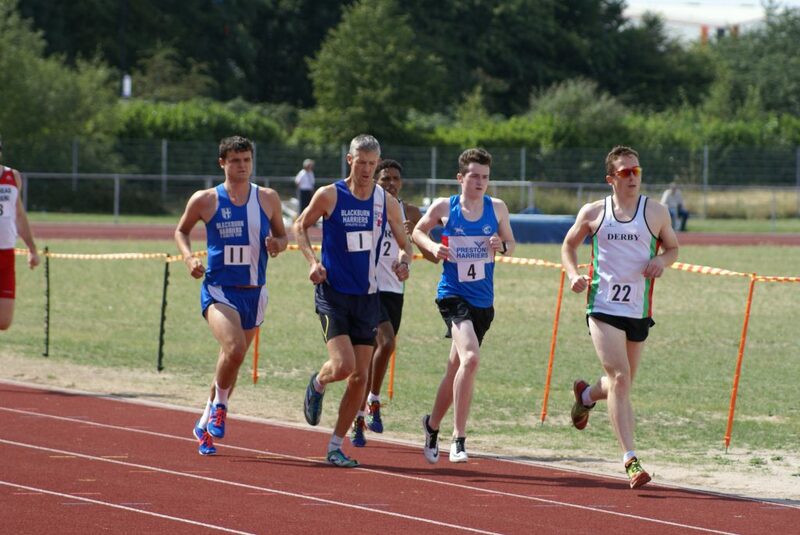 Twenty young athletes ran this trial race won by Mac O’Malley in a time of 28.21 with Thomas Marchant finishing in 17th position running a time of 33.41. 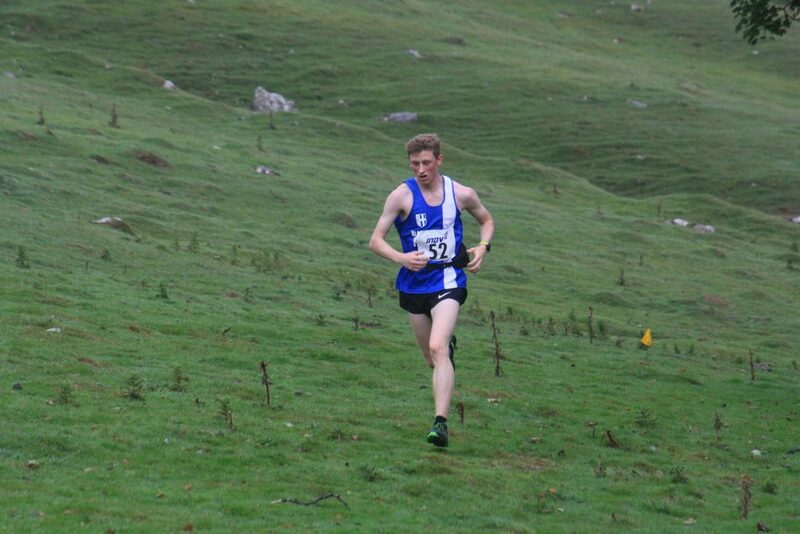 The race was run over 6.8k with 320m of ascent. 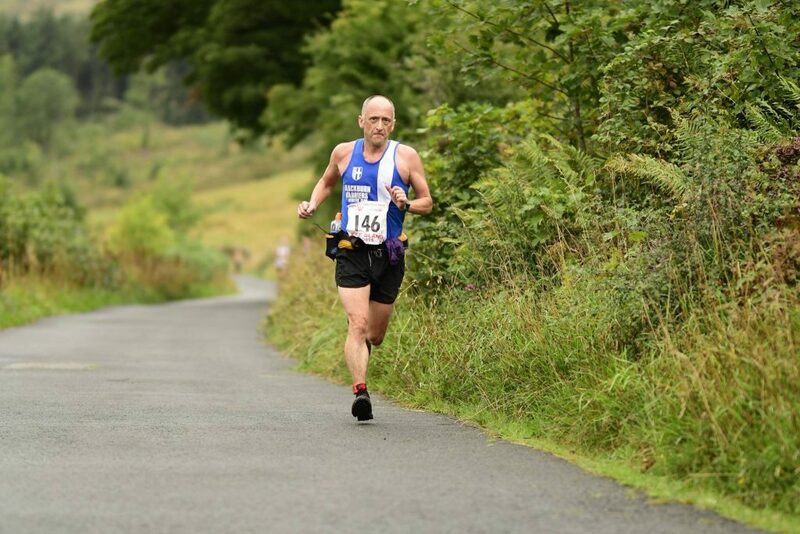 Thomas has been looking to improve on the Fells this year after being out for quite a long time through injury and this season has helped to lay a good base for himself in 2019. 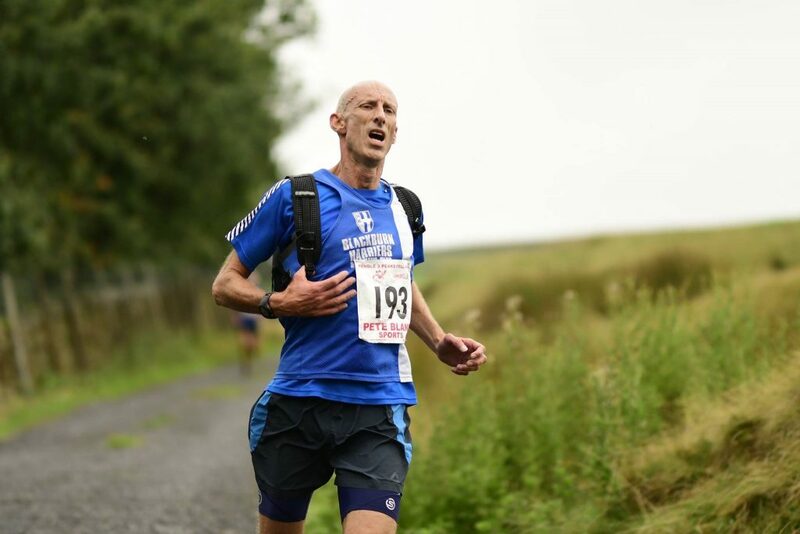 Gary Pearse and Ian Clarkson competed for the Harriers with Gary the first home in 40th position clocking a time of 1hr.47.56 and followed in by Ian in 108th place (2hr.16.13).